We slept very well and got up around 7:30. Breakfast was last day's bread and rusk with jelly. This seems to be typical italian breakfast as we later found out. But we got good tea and hot chocolate. It was mostly cloudy and unpleasant outside so we decided to take the cable-way down to Macugnaga and do some shopping. At the top of the cable-way we met a hiker from Saas who had hiked up from there in the morning to visit the grave of relatives in Macugnaga. He left at 4:30... He explained that during the 30s the weak economy in Switzerland made some inhabitants of Saas migrate to Italy for work. In Macugnaga we did some shopping for a picnic lunch. The clouds did not disappear but it was not raining so we set out for Colle del Turlo. The sign in Macugnaga suggested a total hike time of 5:45. The path first descends the Anza valley for a bit but soon begins to climb gradually and turns south into the side valley leading up to the pass. After about one hour we reached the Lago delle Fate, an artificial lake that was partially blue and partially brown due to recent rainfalls. There were two nice looking restaurants on the lake but it was still too early for lunch so we continued on. The trail remained moderately steep and it we made quick progress. At an altitude of about 1560 meters, the creek splits up into several small steep streams and the trail starts to climb in earnest. It leads across Alpe La Piana and heads into the forest. 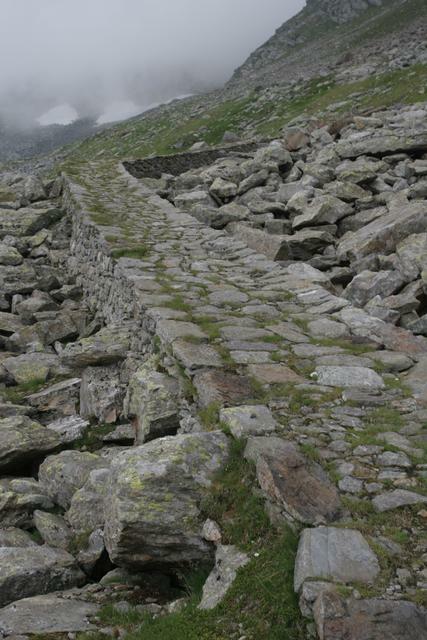 The trail is quite exceptional, it is surfaced with natural stones of varying sizes and about 1,5 to 2 meters wide. Walking up hill on it was quite efficient. Around 13:00 we took our lunch break and enjoyed some excellent cheese from the Rifugio G. Oberto which had been leftover the previous night. 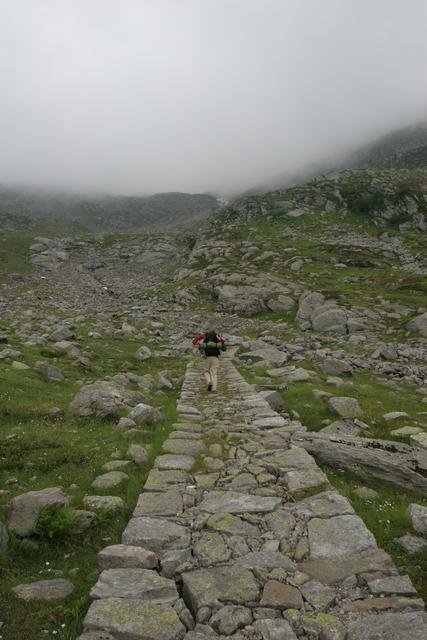 We passed some stone ruins on Alpe Schena at 2037 meters and soon reached the Lanti bivouac. Since it was still only about 14:00, we decided to try to at least cross the Colle del Turlo before nightfall. Since we were carrying a tent, mats and sleeping bags, we could have camped out anytime so the clouds did not deter us. Higher up, the path became even more impressive. It kept a very steady grade and used switchbacks to gain altitude. Even across fields of large rocks it was completely smooth and made for efficient travel. We took another short break to eat some fruit and granola bars. Closer to the top the weather started to become less pleasant. The wind picked up and it started to rain a bit. We arrived on the pass around 16:00 (2738m). There was no view to speak of so we took a quick picture and started to head down. Soon we had to put rain covers over the backpacks. Fortunately the excellent path conditions continued on the Alagna side of Colle del Turlo so we were able to descend quite quickly. However, the sign at the top which promised only 2 hours of descent was far too optimistic for us and it took us nearly 3 hours to reach Rifugio Pastore. We were pleasantly surprised by this night's lodging. 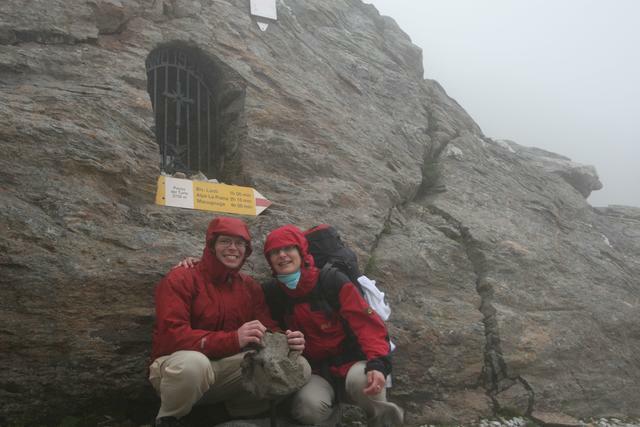 Rifugio Pastore is at an altitude of only 1575 meters and quite accessible, so there were hot showers. It was quite full so we only got beds in the shared quarters, however, they were very nice and it was not completely occupied. Dinner was again very good, this time the polenta with ham and the chicken were the most delicious items for me. I bought a more detailed map of the south side of Monte Rosa to better plan the next days. The solo hiker we had met the previous night arrived a bit after us, she had left before us but did not use the cable-way bringing her to a total of about 12 hours of hiking! We also made the acquaintance of a former mountain guide from Ireland who was doing the TMR in the opposite direction. He had some interesting stories to tell and some of his gear was self-made.